What have I done today for peace? “What we’re really doing is sending out a message to the world, mainly to the youth, especially the youth or anybody, really, that’s interested in protesting for peace or protesting against any forms of violence… There’s many ways of protest, and this is one of them. And anybody could grow their hair for peace or give up a week of their holiday for peace or sit in a bag for peace. Protest against peace, anyway, but peacefully, because we think that peace is only got by peaceful methods, and to fight the establishment with their own weapons is no good, because they always win, and they have been winning for thousands of years. They know how to play the game violence, and it’s easier for them when they can recognize you and shoot you”. We may be imagining a grand gesture or grand bouquet that we must do to make anything happen, but that’s not true. You don’t need to do anything grand or on a grand scale. Doing things for peace costs nothing, it’s free; your words don’t cost a thing. When they say, talk is cheap, it is because its free lol. You may be asking well I want to do more but I don’t know how. I’ve prayed for it so many times and I still don’t have a clue what to do. If we can all agree that praying is the “act” of speaking to God or a higher power, then what have you done to “listen”? The answer is, meditate. 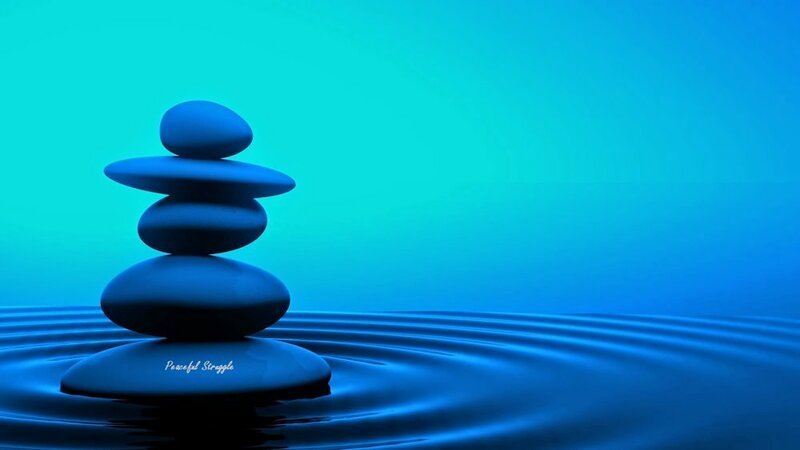 If praying is the “act” of speaking, then meditation is the act of “listening”. Use this tool to your advantage, nothing is immediate, don’t falter if its not instantaneous. Try, keep trying, try harder, push even further and to those who are determined, you will find! PEACE TAKES ONE ACTION OR GESTURE AT A TIME! WHAT HAVE YOU DONE TODAY FOR PEACE? 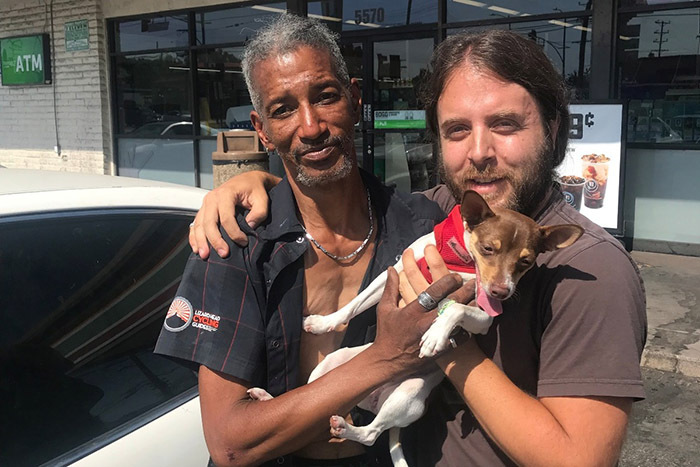 James, who does not own a phone, noticed the number on Maya's dog tag and tracked down a phone to call Darge and let him know his dog was safe and in good care. "This angel man named James told me that his street name was coincidentally 'Canine'. This man loves dogs and as soon as he got Maya, he fell in love. He's been living out of his car with his pal Andy for months, just trying to get by. James recently lost his own dog a week ago and has been torn up about it ever since. When Maya ran away, it didn't take her long to join the company of some nearby homeless guys setup near my office in East Hollywood. One of those guys was friends with James and knew how hurt he was, so decided to gift Maya over to him, I'm guessing so he could keep her forever. After a few hours, James pulled Maya's harness off and noticed her dog tag with her name and my number on it. James didn't have a cellphone so he had to wait until the next day to call me. I can't truly express the emotions I felt when I finally got that call. I could feel the warmth of James' heart through that conversation. He said that once he saw that she belonged to someone, he was devastated and knew what I was going through. You may or may not know that every emotion that you have produces a specific chemical reaction within your brain. This chemical then travels throughout the entire body and affects you more than you know (https://share.upmc.com/2016/09/about-brain-chemicals/). 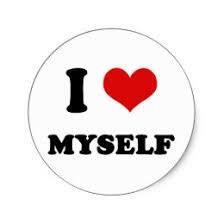 So a great practice to make sure you are producing more “positive” chemicals within your body is to say: “I Love Myself” or “I Love You”. Do this many times throughout the day, at times when you feel sad, mad, bad, down, low, etc. This will help lift you up and provide a better feeling. Another way of saying the same thing is that, every emotion, action, spoken/read word(s) or thought(s), fills your field with either negativity or positivity depending how you orientate yourself throughout the day. The more positivity you spread into your field the more positivity will be attracted to you or vice-versa. This is because existence is like a reflective mirror, it reflects back onto you what you put out to it. The law of attraction works based on the same principle: Like fields attracts like fields. So if your field is positive, you attract positivity and vice-versa. So remember each day you wake up tell yourself: I LOVE YOU or I LOVE MYSELF! This will help set the pace for your day! Love is the most powerful tool in the universe! 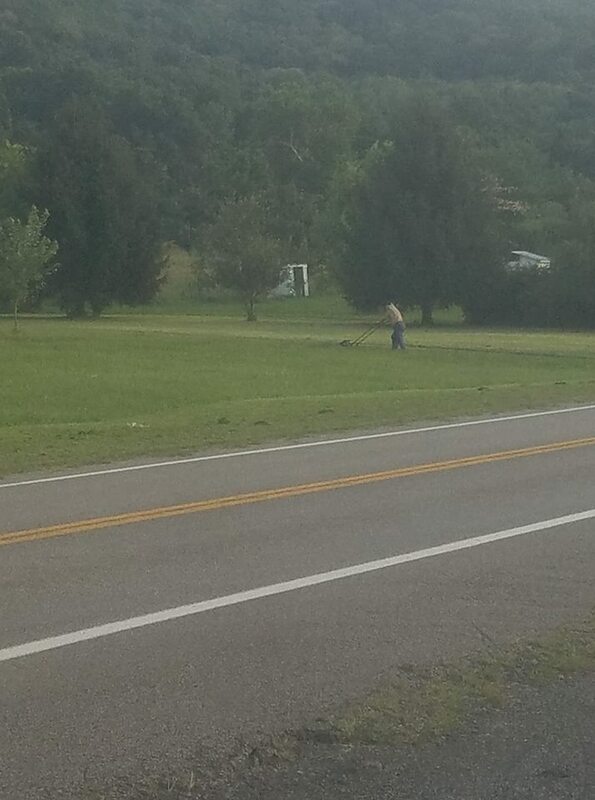 A man who runs a lawn service company in WV helped a man cut his lawn for free. On August 9 (2018), James Johnston of J&J Lawn Service, drove by a man attempting to cut his large yard with a push mower. "On my way home from a 12 hour day of cutting lawns, I seen this gentleman, I have no clue who he is to this day. But I said no way was I gonna let this guy tackle this on his own," Johnston said. "So I turned around and went back and unloaded my mower and drove across the street and ask the gentleman if I could help. His eyes lit up and I took that as a yes. I ran down, jumped on my mower and went to work. As I'm cutting the lawn I look over and see the gentleman hunched over his wife, resting his head on her shoulder. So I get it knocked out in no time. I give them a thumbs up and proceeded to load my mower up. The wife makes her way over before I could leave. She was so thankful! Their riding mower broke down and her husband has been mowing their big lawn with a push mower. It only took 15 mins of my time. I changed their life, for a small moment. I hope someone reads this and feels like doing something good for someone tomorrow. I'm grateful to be where I'm at and I'm thankful for the people that help me get here." But Johnston didn't stop there. The next day he launched a GoFundMe page to raise money to buy a new riding mower for the family. "I have started the process and I'm donating $100.00 and I'm inviting 9 other local businesses to match my donation," said Johnston. "Any donations from anyone is a true blessing. We reached over 15,000 people with our original post and that's amazing. $1 dollar from each of you would be amazing. Remember, we all have been down and out sometime. Just think of the relief the family can have." Johnston set a fundraising goal of $1,000. As of August 12, over $1,200 has been raised by 42 donors.